If you need parts for the Kohler Engine on your Dixie Chopper, visit our Main website at PowerMowerSales.com. We have a complete Kohler Parts Lookup and stock many of the high use items on our shelf for immediate delivery. Use only Original Kohler parts to guarantee longer life and worry-free operation. Find your Kohler parts FAST with our interactive parts lookup. 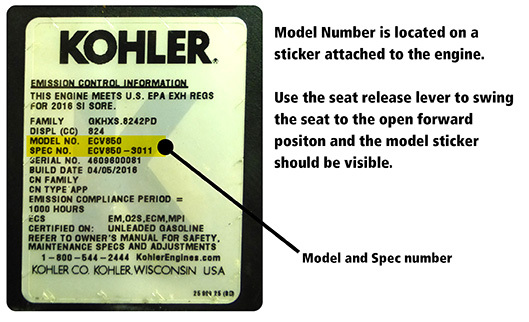 You will need the Kohler Model and Spec number from the engine to guarantee you get the correct parts. You can find this information on the engine by lifting the seat. 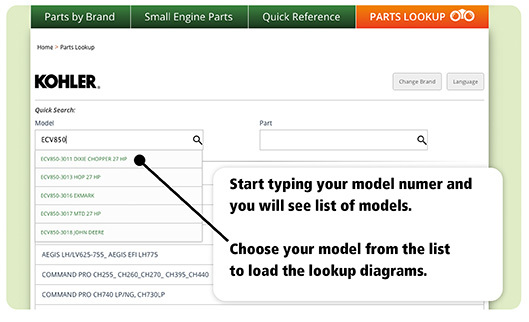 When you get to PowerMowerSales.com use the model information to load the parts diagrams you need. We stock many Kohler parts for same day shipping. For Kohler parts help or to check availability before you order call 1-800-704-4241. If your Kohler parts are special order or not in stock we can have them in 2-3 days. Please allow additional delivery time of any out-of-stock or special order Kohler parts. Use our Kohler parts lookup to find original Kohler parts for your Kohler Engine fast. You will need the model number, type and code on the engine. Browse through detailed part diagrams to find the Kohler part you need. Know your Kohler part number? Use the quick search feature by part number to find it fast. Shop 24 hours a day 7 days a week and order with confidence with our secure checkout. All qualifying orders ship with Flat Rate Shipping.